I've seen the scratch off concept done so many time but this one was a great execution by Martha Stewart. I love doing this --- I made scratch-off Valentines last year for my small group using a recipe I found via Family Fun magazine. I applied the paint/soap solution to clear contact paper and then cut out whatever shape I wanted. Peel the backing off the contact paper and apply directly over top of the image you want to cover up! Easy! I love this idea! It is such a unique save-the-date and so much fun! 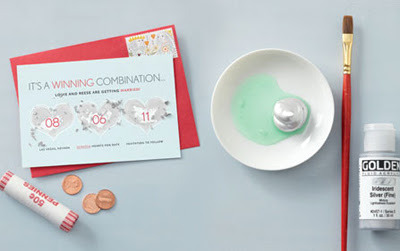 I love the idea of using one of those for a save the date like in the picture. So creative! Smart! Would love to try them once I'm free! Fun idea for invitations! Thanks for sharing! This is wonderful. I loved them immediately when I saw them in Martha's magazine It's just so much fun! Cool idea! I hope I can try it out mmyself. I liked Valerie's suggestion using contact paper. I am really surprised that this is very easy to make! I thought only some high tech machines could do this! I cannot believe you can make your own scratch-offs! Love it!!!! There are also scratch-off inks available on Etsy.